As versatile as they come, the JBL PRX425 dual 15-inch, two-way, passive loudspeaker offers the power handling and frequency response you need to build a robust passive PA system. 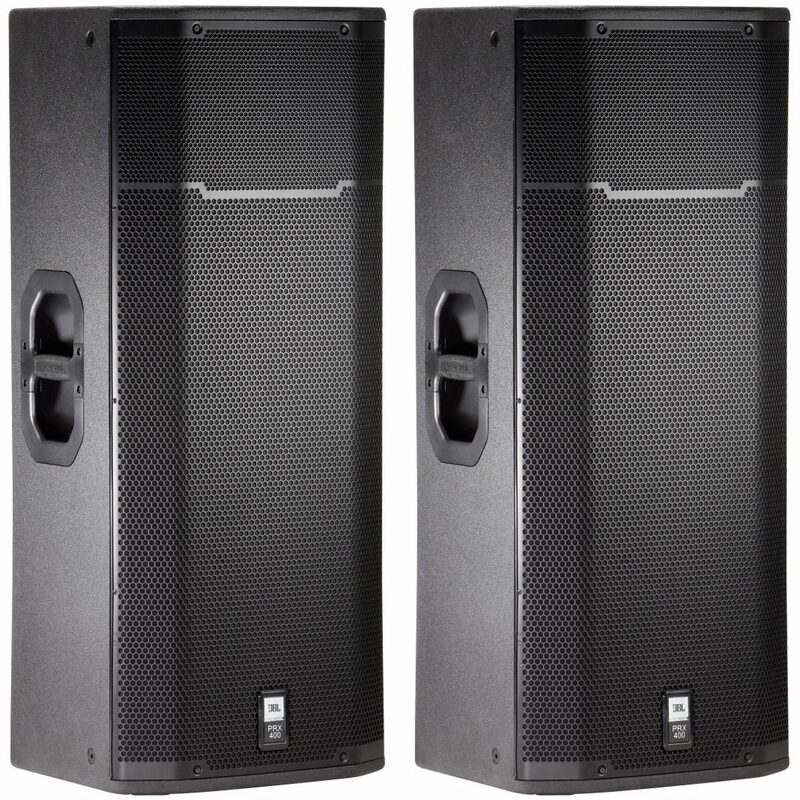 Ideal for use in any medium to large room, from concert sites and clubs to schools and houses of worship, this 2x15" loudspeaker is capable of handling up to 2,400 Watts of peak power. The PRX425 lets you simplify your setup: enjoy exceptional low-end presence without the need to tack on subwoofers to feel the bass. When you add these full-range passive speakers to your rig, you get reliable, powerful performance for even the most demanding of applications. Yes, your PRX425 speakers will get plenty loud -- but as JBL cabinets, they also deliver superior detail and clarity. Dual 15" woofers shore up the low end, and JBL's SonicGuard system protects the PRX425's electronics and high-frequency driver when you draw too much power. With a super-high power rating (600 Watts continuous, 1,200 Watts program, 2,400 Watts peak), the PRX425 can fill a big room -- and its 90 degree x 50 degree coverage pattern means that everyone in the room is in the sweet spot. These portable loudspeakers are quite rugged. Take them with you on tour, set them up and tear them down a million times and you'll still get the same performance as when they were new. The PRX425 has a strong hardwood cabinet made of birch and poplar, coated with DuraFlex for the ultimate in protection. A heavy-duty 16-gauge steel grille protects the drivers, keeping them safe from kicks, punches, thrown objects -- you name it. And you can mount your PRX425 cabinets any which way with its twelve M10 suspension points. - Dimensions (H x W x D): 41.1" x 16.9" x 20.5"
The JBL PRX425 dual 15-inch, 2-way passive loudspeaker is the perfect choice for DJs and bands who need low-frequency extension from the convenience of a stand-alone cabinet. JBL PRX400 passive speakers were designed to provide the sensitivity, frequency response and power handling needed to address a multitude of demanding audio environments while still being reasonably priced. For musicians, DJs, House of Worship, public address, or suspended in a commercial environment like a school or nightclub, JBL PRX425 passive speakers can be used with a powered mixer or a full rack of amps and signal processing, delivering the sound power and bandwidth necessary to make loud music sound natural and even quiet speech intelligible. Comprised of tour-tested JBL components in rugged enclosures with professional connectors and suspension points, this three-way design tackles tough jobs affordably and professionally. "Superior Sound! Awesome customer service. Matched price instantly." Overall: I am a mobile DJ for more than 15 years. I purchased the PRX series without trying them first and wow was I amazed. The weight is manageable and the subs also rock. They take everything I can throw at them. A little pricey but worth it. You will not go wrong with these. The appearance is also superior to the competition. 45 of 48 people (93.75%) found this review helpful. Did you? Overall: I was fortunate enough to pick up a pair of these. Never,in my life of playing (35 years) have I heard such powerful clarity with the pure separate lows & highs w/out any mud or Resistance .Powering them through my amps at 4ohms. allows HEADROOM to spare.Big gigs on the road or whatever your PA Needs may be,hands down.Top of the sound chain here & they LOOK GEAT!